This painting depicts a herd of deer frolicking and at rest among a dense grove of maple trees in autumn with white birch scattered here and there as well. The painting conveys the flourishing scene of an autumn day somewhere to the north. The deer were completely rendered in light ink and delicate washes, while the trunks and branches of the trees were first delineated with ink and then piled with dense clusters of leaves in outlines. The leaves were then filled with light and dark shades of red, white, yellow, ink, and light blue depending on the type of tree, creating for a dazzling and varied appearance. 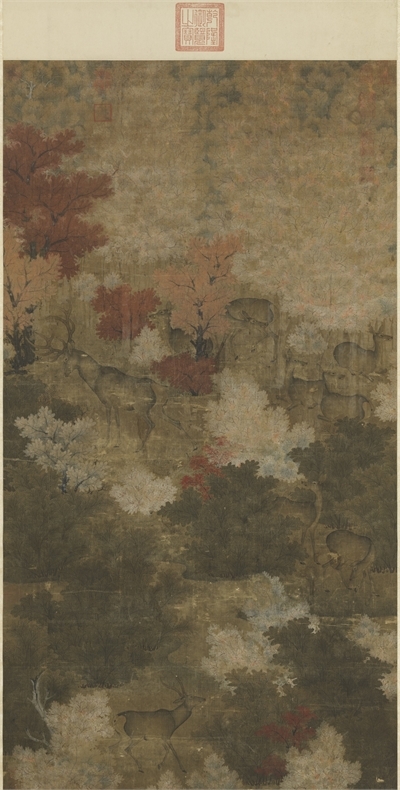 The style and dimensions of this painting are quite similar to those of another work in the National Palace Museum ("Herd of Deer in a Maple Grove," verified and declared a National Treasure in 2012). Neither has the seal or signature of the artist, and it is now assumed that both came from the same original set of paintings. Their archaic and overflowing manner has an extremely decorative touch, and the techniques of painting and coloring differ from those used in the Chinese tradition, leading scholars to propose them as representative works of the Liao dynasty from the latter half of the tenth century.